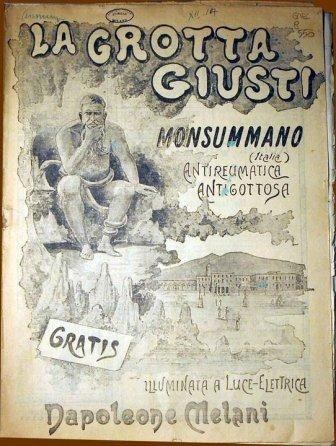 The original building still over the "Grotta Giusti"
“Grotta Giusti can be found in the spa resort of Monsummano Terme, originally the 19th century country home of Tuscan poet Giuseppe Giusti, located between Florence, Pisa and Lucca. The story started in 1849, on a hill overlooking the town, when laborers who were working in a limestone quarry owned by the Giusti family removed a large boulder and discovered the entrance to the cave. Upon further investigation, they found that the cave had water in it, and decided to inform Domenico Giusti. He ordered the entrance to be expanded and lowered some volunteers down to explore the natural well even further. 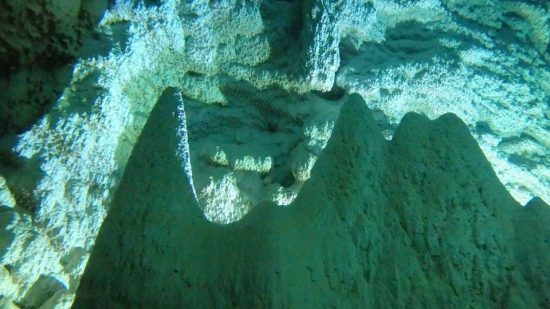 What awaited them underground was a magnificent spectacle of nature: stalactites and stalagmites hanging from the vaults and rising from the ground, tunnels and underground openings and a pond of hot water which filled the entire place with its steam. The explorers soon understood that the steam which made them sweat profusely had healing powers, particularly one individual who realized that the joint pain he had been suffering from for years had suddenly disappeared. The news of this discovery spread quickly, arousing the interest of eminent doctors who studied the phenomenon and found scientific confirmation regarding the clinical effectiveness of the treatment. 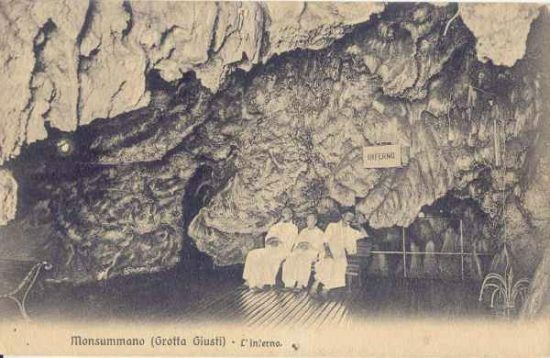 In order to make visitors to the cave feel more comfortable, the Giusti family commissioned a series of treatment rooms to be built, so that this natural underground phenomenon could be turned into a proper spa retreat. 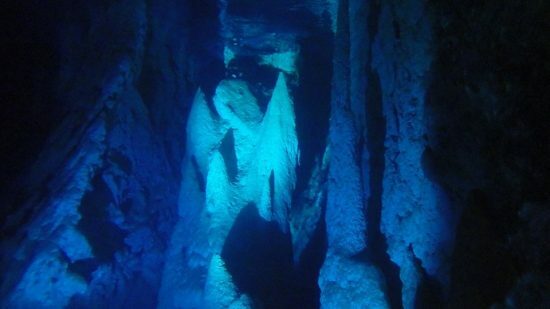 Once complete, the cave’s reputation started spreading far and wide, with more and more people wanting to experience the natural steam baths and their healing powers. The Thermal Cave was particularly popular with the French and English who started to visit Grotta Giusti more often as a destination for their summer holidays. In 1867, Giuseppe Garibaldi vouched for the therapeutic nature of the cave, and personally thanked the owners by sending them a letter. In 1880 the Royal Hotel was built, and soon started attracting nobles like the Prince of Naples and Giuseppe Verdi. 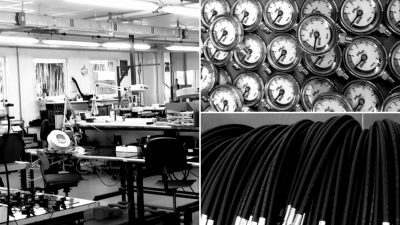 Over the years, the cave has undergone significant changes and upgrades which have made it safer and easier to access without disturbing its natural beauty. 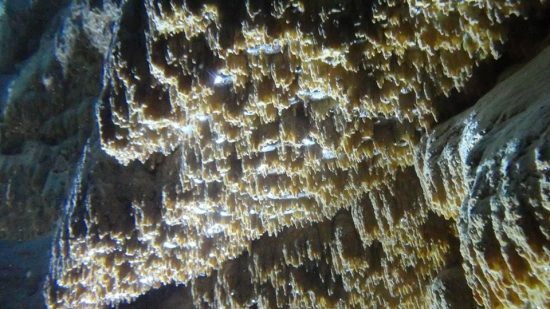 Grotta Giusti, as beautiful today as it once was, is officially the largest thermal cave in Europe, and stretches over two hundred meters below the resort. Divided into three distinct areas called Heaven, Purgatory and Hell, the cave offers visitors a chance to experience a unique environment with temperatures ranging from 28° to 34°C, and natural steam with healing and therapeutic properties. 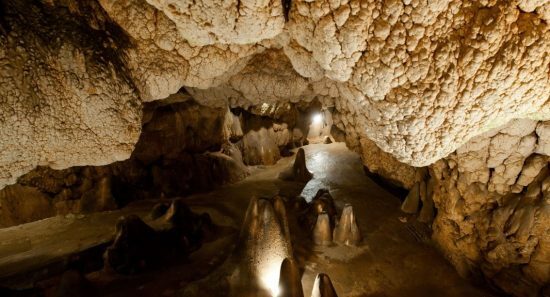 The interiors of the caves are decorated with stalactite and stalagmite formations, and feature several underground labyrinths with spacious caverns. The large vaults in the rock are natural formations. The bottom of the cave is known as ‘Limbo’ - here the temperature always remains at a pleasant 36ºC, regardless of the weather outside, and offers wellness seekers a sparkling pool of water to soak in during winter and summer. 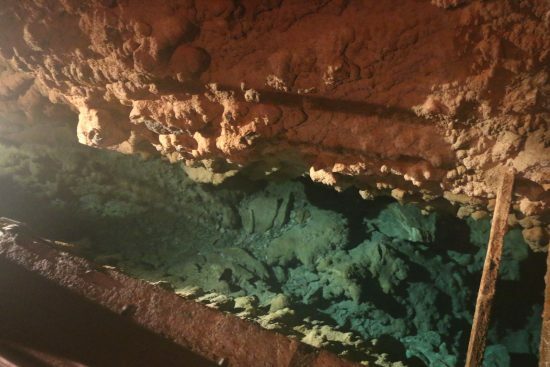 Despite all this business development and activity, the current owners also allow diving in the underground lake, which makes this place totally unique. 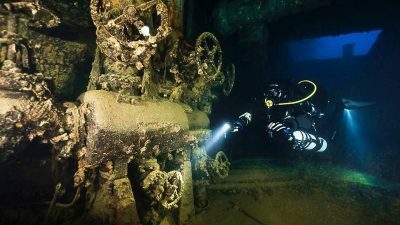 Luciano Tanini heads a group of dive guides who make these experiences possible, accompanying divers to explore the flooded fracture. 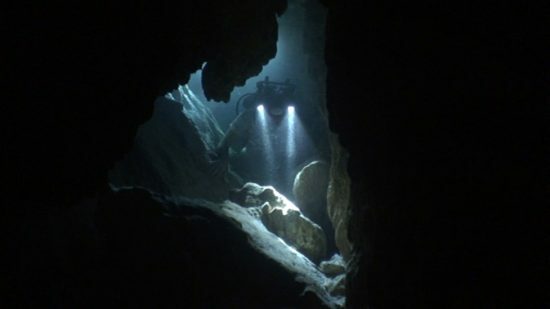 The depth is not excessive, never more than 60 feet (18m), and the equipment needed is similar to that used in cave diving. You can even receive a distinctive specialty from the local diving Instructors: Spa Diver Entry, Spa Diver Course and Spa Diver Advanced. 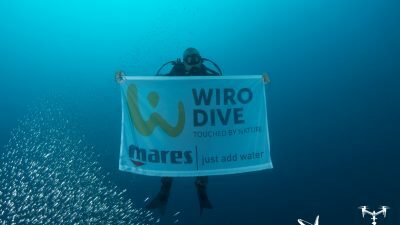 The dive organization is impeccable, and the guides are highly experienced; divers are given a substantial and thorough briefing, after which they can proceed into the water. 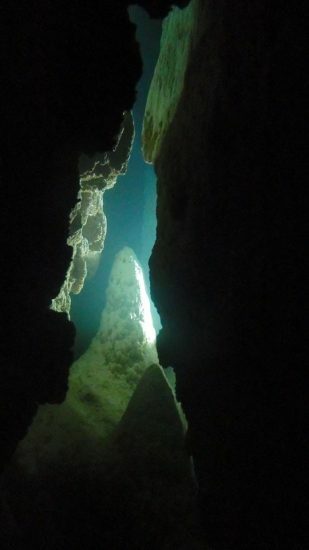 The dive starts in the ‘Limbo’ area which is reached via a vertical ladder a few feet high, after passing through a cavity lined with impressive rock formations. 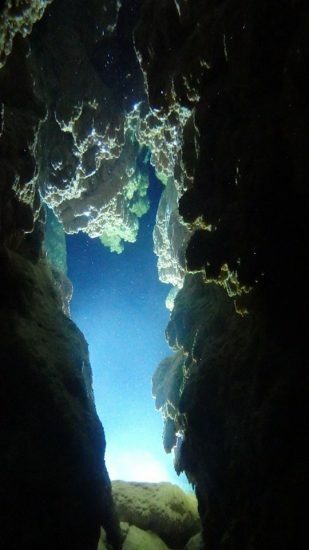 This is the only place in the world where the entrance to a cave dive is so comfortable and easy, directly from the spa structure. You do not need a wetsuit or a Mares|XR Dry Suit - XR Line either. Obviously you need your swimwear, a Mares t-shirt or rash guard and sport shoes or Mares|XR Rock Boots - XR Line are the right gear for these crystal clear waters. Protect your head and carry your lights with the fantastic Mares|XR Rigid Cap - XR Line. Something important to take with you is your underwater camera! The visibility is endless and the scenery is beautiful. The shooting opportunities are endless, from selfies to stunning passages. Make sure you have enough light and enough power as some rooms are quite spacious. The Mares|XR DCTV canister light is the perfect tool here. Underwater, you walk, swim and fly from rock to rock. 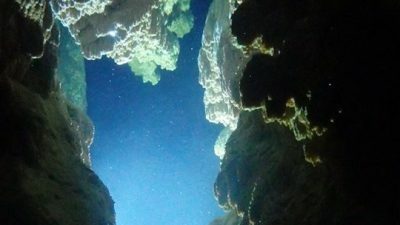 The diving here is a really unique experience of zero gravity in warm water. The water is not so hot that that you feel uncomfortable or oppressed, and not so cold, you never shiver or feel uncomfortable. 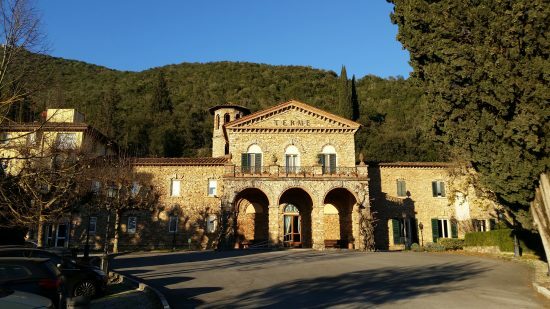 You have the feeling you could stay there for hours and hours, but you shouldn’t overdo it, otherwise you will sleep like a baby once out and miss the fantastic culinary offerings of Tuscany! There’s definitely no other place like this in the world! 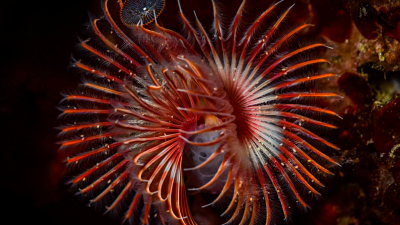 Underwater photos have kindly been provided by Paolo Panconi. 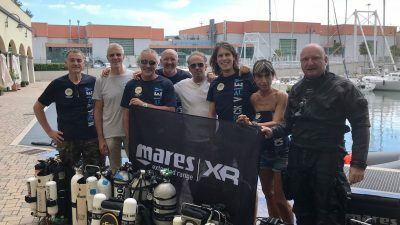 For a complete set of technical and cave diving gear, our best and only choice is Mares│XR. Last but not least, nothing would have been possible without the support of Luciano Tanini and the Grotta Giusti team of guides and instructors: Davide, Paolo, Giovanni, Emanuele, Claudio, Fausto and Simone… to name a few. Thank you very much for the information and the best video ever!!! Hope one day I will be there!